Chopard takes to the high seas and leads us to the heart of dazzling marine sights. Enlivened by the whirling dance of Happy Diamonds, the sea reveals its most precious treasures with a new Happy Fish model. Diamonds on the horizon? The sea has never been as beautiful as when evoked by Chopard. Playfully and joyfully sparkling as they dip and bob across the foam, Happy Diamonds lead us on a merry dance embracing multi-facetted maritime delights. They radiate an original and powerfully poetic strength extolling the colourful wonders of a far-off paradise. Translucent waters, velvety-smooth waves enhanced with textured mother-of-pearl: the skills within Chopard’s artisans is a journey in itself. Launched in 2002 with a distinctive marine-life inspiration, the Happy Fish is another stopping point along the long-distance voyage undertaken by the Happy Sport, which has perpetually reinvented its peerless chic through each of its interpretations. Created in 1993 by Caroline Scheufele, it overturned existing watchmaking conventions by the unusual association between steel and diamonds. The radical modernity of its lines and materials make a perfect match with the playful spirit of Happy Diamonds, the setting-free of diamonds that dance joyfully between two sapphire crystals. The exquisite Happy Fish collection welcomes a splendid model in a 250-piece limited edition series. The Happy Fish watch features a navy blue textured mother-of-pearl dial with subtle colour nuances educing shimmering seabeds. In the dial centre, a delightful fish that remains extremely discreet by day, lights up and reveals itself when the night falls. 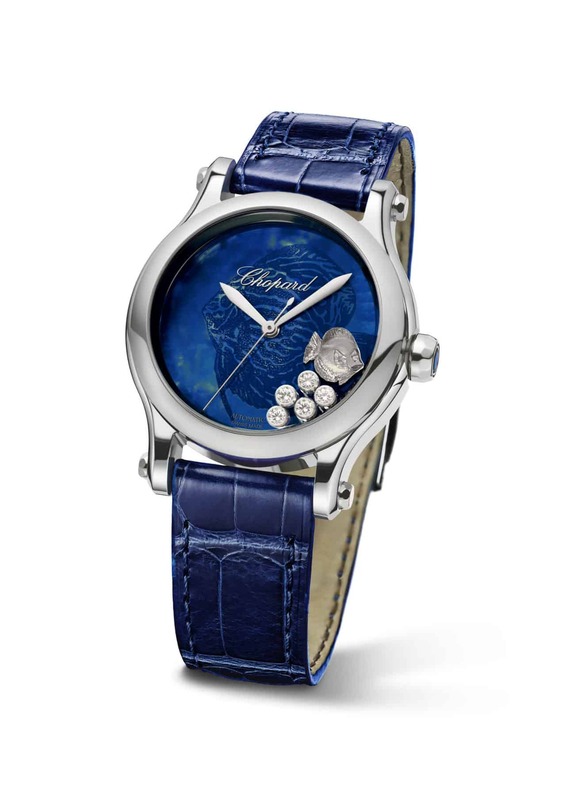 Five moving diamonds, luminescent at night, along with a small white gold fish, dance as if is in one of the world’s most precious aquariums, featuring a navy blue alligator leather strap that brings out the colours of the dial. 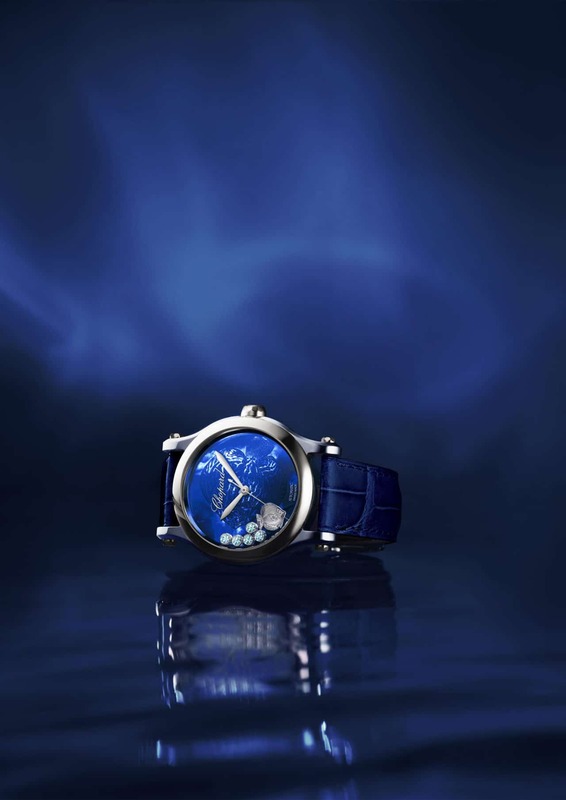 Setting the cadence for this aquatic ballet is a self-winding movement housed in a steel case. Chopard Happy Sport 36mm Happy Summer!